How to Select the Best Gas-Powered Wood Chipper Shredder? Because there are so many different kinds of gas wood chipper shredders on the market, consumers are often confused regarding which might be the best option for them. It’s all well and good to assume that any gas-powered wood chipper will do the job, but that’s not the case. Some are suited to professionals, whilst others are only suitable for homeowners in residential settings. Some will be best suited as tree shredders, whilst others are mulchers, composters, chippers, and shredders all in one. Because the buying process can be overwhelming, we’ve written this buying guide to help. Within it, we list several top-rated machines on the market, all designed to meet the needs of different buyers. Review each product carefully and weigh up the features to ensure you get the best gas chipper shredder for the money. There are several models and brands of gas wood chippers on the market. Many are produced by different manufacturers around the world. Because there is so much variety, the work you will be carrying out can ultimately determine the best machine for the job. Are you looking to chip and mulch garden waste that makes your residential section look untidy? Are you a farmer in need of something reliable to clear a paddock? While petrol-powered wood chipper shredders are more powerful than electric models, they still have their limitations. Read the product information carefully to ensure the engine capacity will suit your work type. Every year, an average of three people die in the United States due to injuries caused by wood chippers. While manufacturers install safety features to reduce the risk of injury, they can’t eliminate it completely. You can do several things to keep yourself safe, and many of these tips are included in the manufacturer’s guide with your gas-powered wood chipper. Wear a safety helmet, goggles, ear protection, and gloves. Make sure your chipper is in good working order. Ensure all machine guards are installed correctly and are free from imperfections. Have a second person present to help operate the machine. Keep your hands away from the in-feed hopper. Don’t touch moving parts when the machine is going. Don’t run the chipper while it’s unattended. Make sure it’s on even ground. Wood chippers are dangerous and all safety measures should be taken to reduce the risk of injury. Even though gas-powered wood chipper shredders are more powerful than their electric-powered counterparts, they still run into efficiency issues when not used correctly. If your machine is not running as effectively as it should be, it’s easy to blame the brand or manufacturer. However, you should be checking the way in which you use it, in relation to how it’s recommended to be used. The same can be said for the purchasing process. Pay careful attention to the specifications to ensure the work you’re carrying out is suitable based on the CC rating of the engine. Often, the higher the price tag of the chipper, the more advanced the features. Although, there obviously are exceptions to the rule. Most gas-powered wood chippers have a chipper mechanism with knives, a collared hopper, a tub or bag for chip collection, and a flywheel. Some may also have a drum connected to the engine to make it run. If you’re not sure what features you require, review the following bullet points when looking at our listed products. The reduction ratio – how small the chips are. If there’s one thing you don’t want to skimp on, it’s wood chipper maintenance. While it might seem costly at the time, it could be even more costly if your machine malfunctions, causing serious injury. Remember to always undertake regular maintenance, and keep your machine in tip-top shape. Many tips can be found within your user manual. Clearing debris from the engine. Replacing and/or cleaning the air filter. Sharpening and/or replacing the knives/blades. It can be hard to know what the appropriate amount is when spending on a gas-powered wood chipper shredder. After all, there are so many things to take into consideration. Your price range should depend on what you need your chipper to do. The more power and features you need, the more you generally need to spend. Always opt for the machine that suits your requirements the best – rather than the product that seems like the best deal. Often, the “best deal” can end up costing you more in the long run. It’s compact, portable, and lightweight. It comes with a generous 5-year warranty. You can also purchase a vacuum kit to make the chipping process tidier. It’s only suitable for residential use. Many customers say components aren’t well-made. Dimensions: 51 x 24.4 x 29.9 inches. Chipping Capacity: 3 inches in diameter. QWhat engine does it have? QCan you adjust the size of the chips? AThere are two chip size options. QDoes it chip wet or green material? For homeowners looking to take care of branches and garden waste with ease, this Tazz wood chipper is a good option. It can take care of all kinds of garden materials, including leaves, branches, and twigs. It has a powerful 212cc engine, and a 5-year warranty to cover any manufacturing faults. While it’s beneficial in these respects, it costs quite a lot to buy online and in-store. For the price, you could expect to receive something capable of chipping larger branches. However, it gets the job done brilliantly for the homeowner, and for this reason it’s one of the best gas wood chipper shredders for the money. Check out what other people who purchased this product think about it. 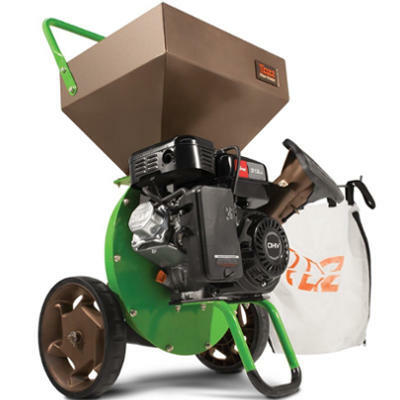 Read Tazz K32 gas wood chipper shredder reviews. It chips and mulches very quickly. It has a side discharge feature to make your work space tidier. It has a direct drive system so there are no pulleys or belts to wear out and later need to be replaced. It has a commercial-grade engine. It’s suitable for large and residential properties. The chips are consistently coin-sized. The bag is small so it fills up very quickly. Dimensions: 37 x 24 x 35 inches. QFor how long do the blades stay sharp? AIt varies. When sharp, the machine makes a pulling action. When blunt, you will notice it starts to push more than pull. QIs the chip size adjustable? For a lifestyle block owner, or a residential homeowner, this Patriot wood chipper shredder will be a welcomed addition. It’s powerful, with its 10HP Briggs engine, and is easy to transport around the property. It also makes quick work of branches of up to 3 inches in diameter, leaves, and other garden waste. When it comes to maintenance, it’s also in a league of its own. With a direct drive system, it removes the need for pulleys and belts. This means there are less parts to replace once worn. It’s not the most cost-effective option on the market, but it’s durable, reliable, and most importantly, powerful. It’s easy to see it’s one of the best gas wood chipper shredders for the money. Check out what other people who purchased this product think about it. 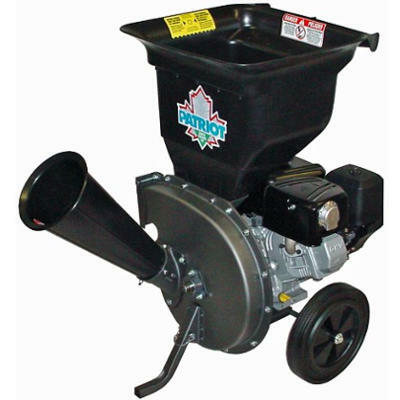 Read Patriot CSV-3100B gas wood chipper shredder reviews. It has heavy-duty cutting knives to make quick work of branches. It converts brush into mulch. It comes with a two-bushel bag. It’s top-rated on the market. It’s for sale at an affordable price in comparison to its features. According to some users, some components aren’t well-made. The wheels are poorly made and fall apart. It’s not good at shredding leaves. Dimensions: 34.25 x 23.5 x 27 inches. Chipping Capacity: Up to 3 inches in diameter. QWhat is its chipping ratio? While it can’t stand up to heavy-duty chipping and mulching tasks, it fills the gap in the market for a residential/lifestyle chipper. It has a powerful 205cc Briggs engine, can take care of branches of up to 3 inches in diameter, and has a good chipping ratio of 20:1. What lets it down, overall, is its quality. Even though it’s not the most affordable option, many of its parts are poorly-made. The wheels are plastic and break easily, whilst even the muffler can split in half after an average amount of use. Whether it’s a cost-cutting measure or just bad manufacturing, buyers must be aware. Check out what other people who purchased this product think about it. 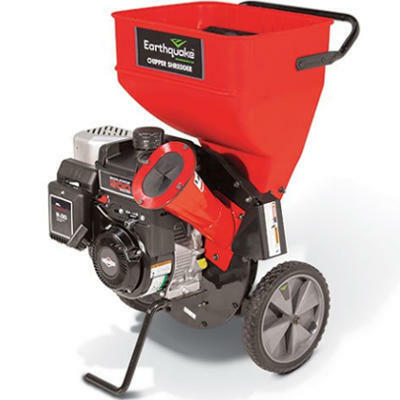 Read Earthquake 9060300 gas wood chipper shredder reviews. It has hardened steel blades that last longer, for cutting branches of up to 3 inches in diameter. It can shred brush and shrubbery. It comes with a collection bag. The tires never go flat. It can be hard to maintain. The instructions for maintenance aren’t very clear and show parts in the wrong place. 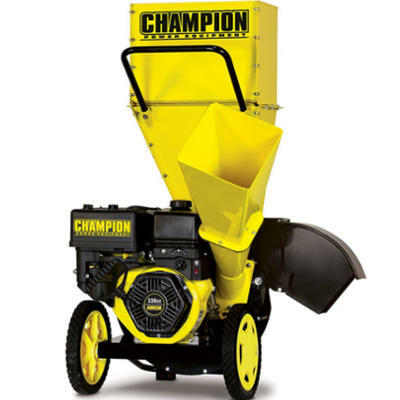 Champion Power Equipment wood chipper shredder. 2-year warranty and lifetime technical support. Dimensions: 41.3 x 25.2 x 29.7 inches. Warranty: 2 years and free lifetime technical support. QWhat is the reduction ratio? Whether you’re a homeowner or a lifestyle block owner, you are sure to see the benefits of owning a Champion Power Equipment wood chipper shredder. While it can’t compete with commercial and industrial chippers, it can meet the market as a reliable chipper to take care of troublesome backyard sticks, twigs, leaves, and small branches. It can even chip your bamboo into small pieces! Overall, this tree shredder is affordable, durable, and ready to provide you with many years of faithful service. Check out what other people who purchased this product think about it. Read Champion Power Equipment 100137 gas wood chipper shredder reviews. It’s very well-made and durable. It has a self-feeding chute to handle longer branches than several other models on the market. It has solid steel casings to ensure moving parts are extra-durable. It’s relatively easy to maintain. It’s selective with the wood that it will chip – it prefers seasoned wood only. It doesn’t work well with wet wood. 2-year residential warranty or 90-day commercial warranty. Dimensions: 36 x 30 x 28 inches. Warranty: 2-year residential warranty or 90-day commercial warranty. QWhat oil does it take? A208cc CR950 Briggs & Stratton engine. QWhat is the reduction rate? This Yardmax wood chipper is packed full of features to make light work of backyard maintenance. While it’s choosey with the kinds of woods it will chip, it does a good job of taking care of seasoned wood with relative ease. It has a powerful 208cc Briggs engine and is warranted for 2 years to cover any manufacturing faults. While it’s not top-rated on the market, it’s a preferred product by many homeowners looking to clear their backyards. Check out what other people who purchased this product think about it. 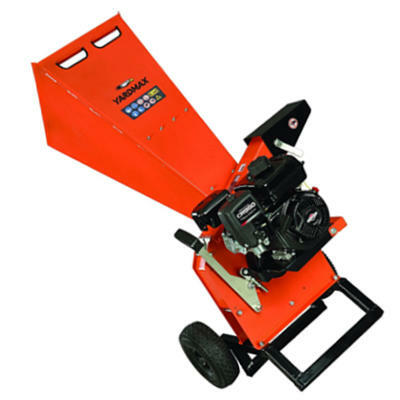 Read Yardmax YW7565 gas wood chipper shredder reviews. Where to Buy Gas-Powered Wood Chipper Shredders? There are many great stores around the world selling a range of tree shredders, mulchers, and gas-powered wood chippers. They are easy to buy in-store, but they can often be easier to buy online. Consumers can certainly get the best gas chipper shredder for the money – and the best deal – when they purchase them from websites such as Amazon. You can read other customer reviews, weigh up the price in comparison to the features, and ensure it’s everything you want it to be before going ahead.